Finding the best 5000-watt amp can be hard because there are so many amps on the market. Luckily for you, we are going to recommend a few of the top amplifiers available. Any of the amps we are going to look at could be considered the best amp. More importantly, though you need to know the power level of amp you need and the input you need. An amp that has these things can make it the best amp for you and your sound system needs. Allowing you to customize and control your sound so you can live like a mobile anarchist, clear and loud. 2 Which is for you? Since this is a dual channel amp it means that two 2500 watt max outputs. They are connected with a bridge however so you can get the full 5000 watts if you need it. The two individuals are two ohms while together they are four ohms. The equipment of this device is housed in a strong aluminum case. That is how it is so light, but the case does provide top protection for your gear. It has Variable Bass Boost (0-12DB@50Hz) – Variable Gain Control – High-Level Molex Input and Fully Protected Circuitry. It also has Hi/Low-Level Inputs and Frequency Response of 15Hz-30KHz. The next amp we are going to look at is the Planet Audio AC5000.1D. This is a true 5000-watt amp. It is a single channel and has a 1ohm output in that channel. The size of this amp is also comparable to the others. It measures 18 inches x 10 inches x 2.25 inches and weighs 12.5 pounds. This makes it so you can tuck it away in most vehicles without having to worry about space. This unit can also put out 2500 watts at 2 ohms thru one channel if needed. The AC5000.1D is designed best to run subwoofers and allow them to function at their optimum level. It has all the possible inputs you could want. It has a high level of input to connect the amp to the radio. It has a low-level of input to connect the unit to the source unit. Lastly, it has a low-pass crossover to help prevent high notes from getting to your subwoofers. This unit can do pretty much anything you want it to, especially once you got it set up right. People really like how easy the Planet Audio AC5000.1D is to set up and get working. They also like all the function it has. If you are looking for a powerful amp, especially for subwoofers, then this is a great option for you. To back this all up it has a six-year warranty, so you know it will last and be reliable. Moving along we have the BOSS AUDIO PD5000. This unit is a powerhouse and has so many different configurations. It is three different ways you can set it up in one and it is easy to set it up the way you want. Before getting into the different features and ways you can set it up though, we will first cover the size. This unit is a lot like the others and measures 18 inches x 10.3 inches x 2.3 inches and weighs 13.5 pounds. This means that you can use it anywhere and that they were able to get all the electronics packed into a tight case still. The case is also a durable metal which makes it strong. 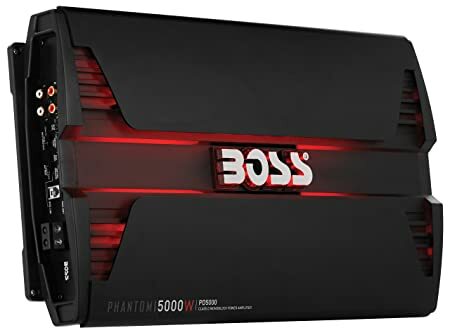 So, the way the PD5000 can run is as a 5000 watt with 1ohm out of one channel, 2500 watt at 2ohm out of one channel, or 1250 watt at 4ohm out of one channel. This makes it so no matter what equipment you have this unit will work for you. It also has all the different connectors you might need. It has low-level inputs, RCA pre-amp output, and switchable phase control. It also has LED so you know that it is powered and give it style. The BOSS AUDIO PD5000 is a great unit and has a solid six-year warranty. Users like all the option it allows. Also, people like that it is scrapable. This means you can mount it down so it won’t move around as you drive. If you are looking for a unit that can give you a lot of options and grow with your sound set up, then this is a great option for you. The last unit we are going to look at is the Sound Storm EVO5000.1. This is another very versatile unit. It is mainly designed for subwoofers and to be a controller for them, but it is still a very powerful amp. It is a true 5000 watts and comes from a single channel. 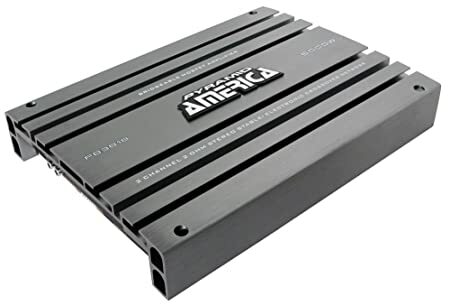 Before getting into all the ways you can run this amplifier in your vehicle though we will first cover the size of it. Like all the rest this unit falls into a typical range. It measures 19.1 inches x 10 inches x 2.3 inches and weighs 14.3 pounds. This is heavier than some of the others, but still isn’t an issue for most people. The EVO5000.1 can be run in three configurations. It can be run as 5000 watts at 1 ohm and single channel, as 2500 watt at 2 ohms and single channel, and 1250 watt at 4 ohms and single channel. This is just like the BOSS unit we looked at. This unit also has all the inputs that you could possibly want or need for your sound system. It has low-level inputs, RCA pre-amp outputs, and switchable phase control. 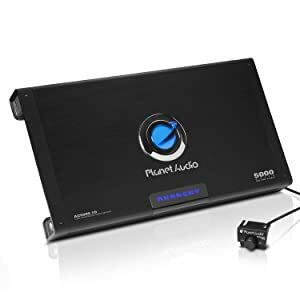 It also has Variable Low Pass Crossover, Variable Bass Boost, and Variable Subsonic Filter to make sure that all the proper sounds pass through your speakers. Users really like the sleek metal case build of this unit on top of the functionality. 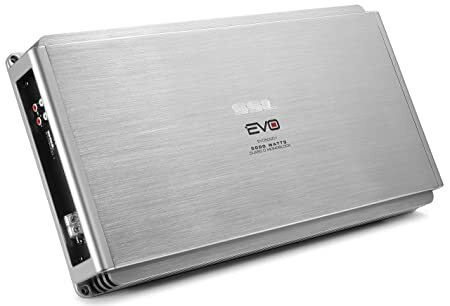 The Sound Storm EVO5000.1 is a very versatile unit that will be able to stick with you for a long time. It has a six-year warranty and because of all the ways you can run the single channel, it means if you get new speakers, you won’t have to get a new amp right away. Also, this amp rides well in your car and is easy to set up, so you can get to your music right away. So, now you may be wondering what amp to get for you. Well, if you are wanting a versatile amp that you will be able to use as you upgrade your system, then the Sound Storm EVO5000.1 or BOSS AUDIO PD5000 because they allow three different configuration setups. If you are wanting something simpler though, then the Planet Audio AC5000.1D or Pyramid PB3818 aren’t bad options either. Any of these four options will work well with the rest of your sound gear. The key when it comes to amps for your cars sound system is to know what watts your gear needs. If you don’t have enough watts, then the system won’t work right. Having the versatility of different setups with your amp is nice because then your sound system can grow. Also, making sure you have all the inputs you need is key, but any of these options should meet your needs. No matter which 5000-watt amp you pick from this list it could be considered the best amp.